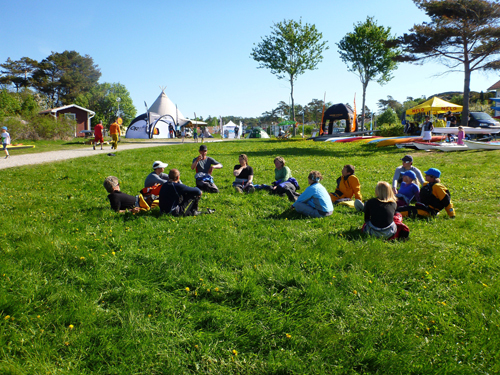 Last weekend Mark and I headed to Tanumstrand, Sweden to instruct at the West Coast Water Festival. 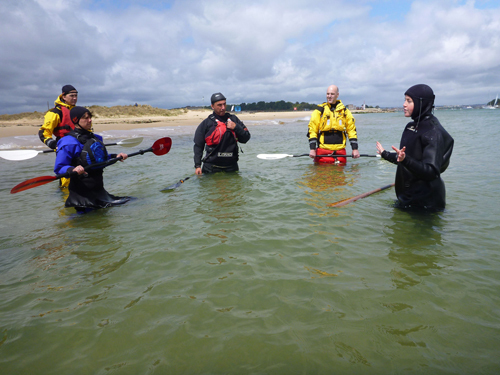 It is one of three symposiums that Outside Magazine organizes. This was the first year of this symposium and it was a fantastic weekend! 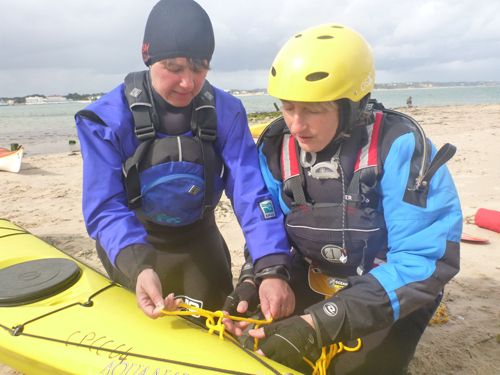 The sunny weather, enthusiastic paddlers and superb location all added to the fun. 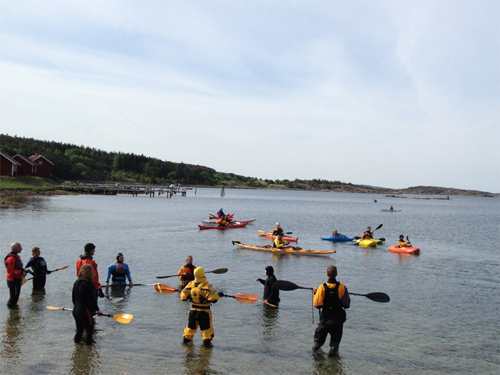 A superb location for a kayaking event. 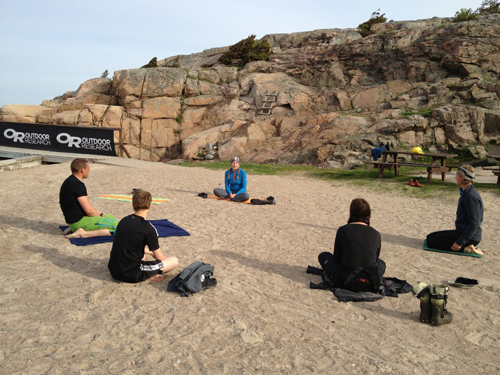 Throughout the three-day event I ran two Yoga for Paddlers sessions, and Mark and I instructed several rolling classes together. 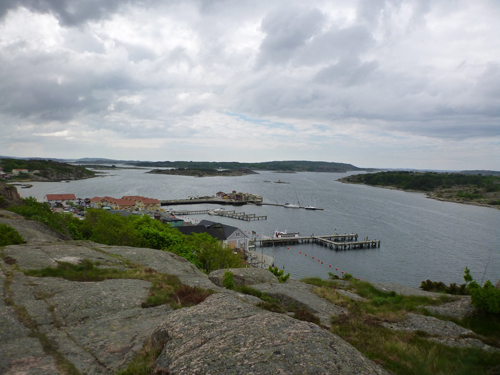 Mark also made his way around part of the archipelago during his Coastal Navigation class. Sunday afternoon we joined in the fun in Nigel Foster and Kristin Nelson’s “Fun with Foster” class, then we headed out for a paddle around the islands. One of five rolling classes. Mark helps a participant work through the steps to get her first roll (she got it)! 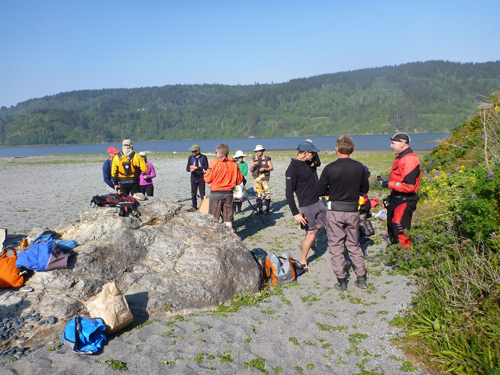 James Stevenson discusses incident management before heading out on the water. 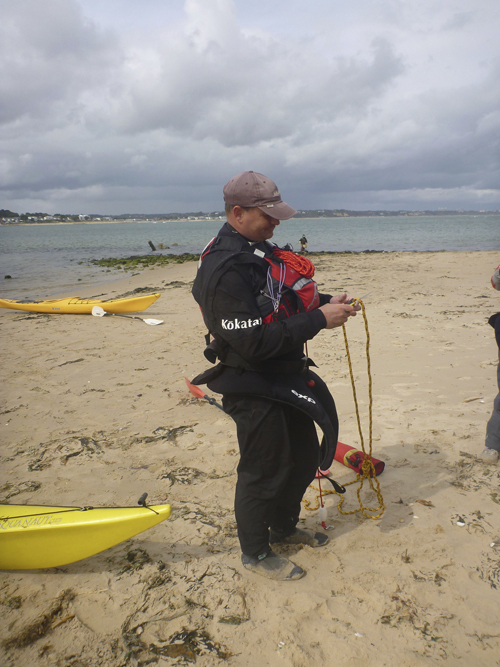 Nigel talks about wind and its effects on a kayak. 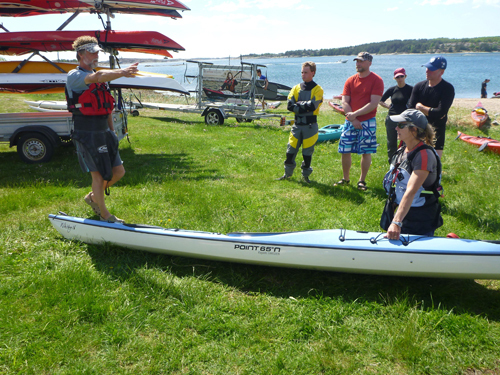 The event had demo boats to try out, as well as several vendor booths. 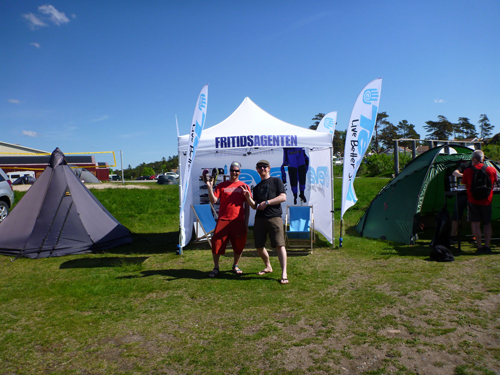 Guido from Outdoor Research and Mats from Teva enjoy the sunny day. 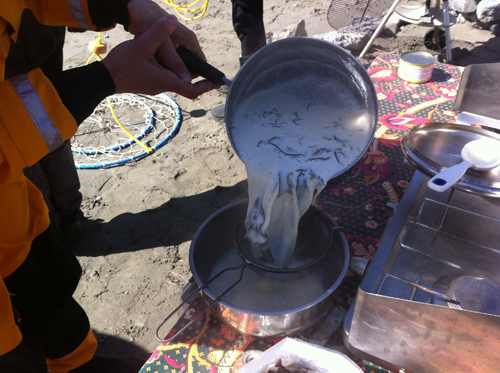 There was a full schedule, which included an on-water show. Nigel demonstrates boat handling skills during the on-water show. After Nigel’s act I rolled a Hobie kayak. Then Nicolai Ilcus demonstrated some incredible balance. 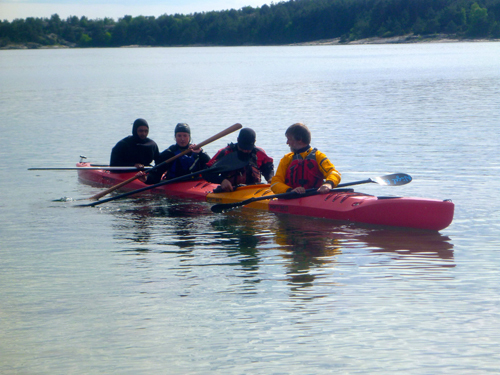 The on-water show ended with Nigel, Nicolai, me and Adam Hanson rolling a four-person kayak. 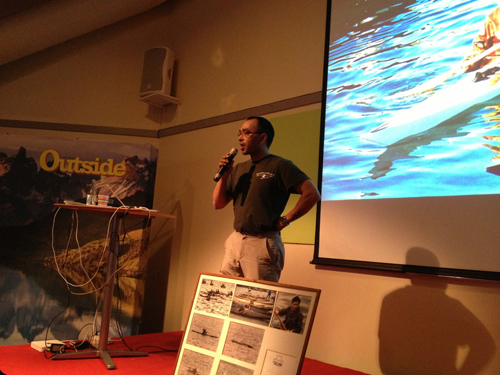 There were evening presentations as well, which included an informative presentation by Adam Hanson of Greenland on the Greenland National Kayaking Championship. Adam talks about the championships. 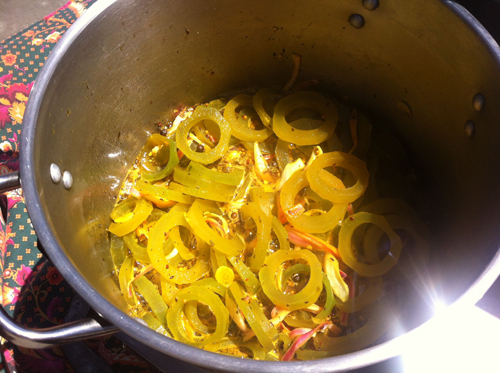 Thanks to Glenn Mattsing and Ulrika Larsson for keeping us fed and watered and taking such good care of us! 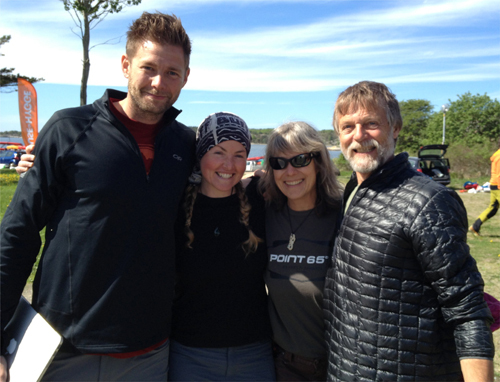 Glenn, me, Kristin and Nigel. 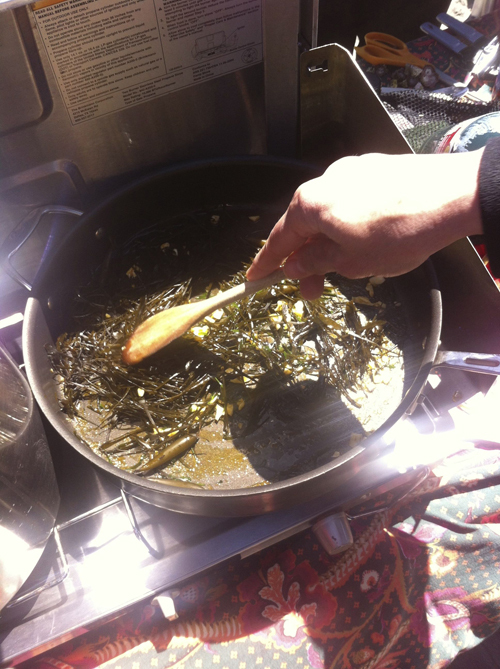 At home, in Northern California, water moves up and down. 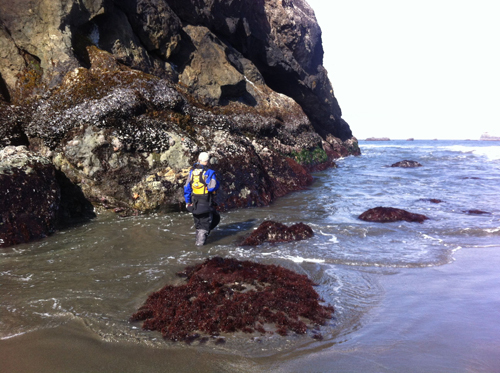 Once past the surf zone, you can sit and “ride the elevator” as our friend Michael often says. 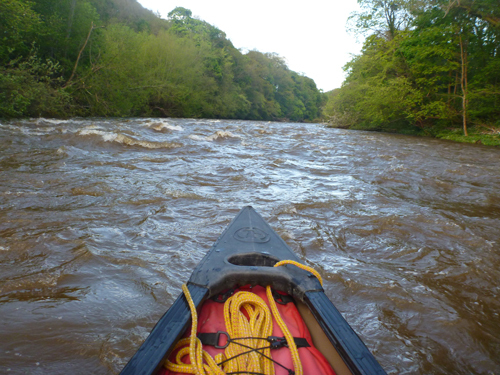 Mark and I have spent the past week paddling in Wales. From most launch points the water appears as flat as a lake, but don’t let it fool you, because this is where water moves sideways… and I’m starting to really like it! A great way to spend an evening. 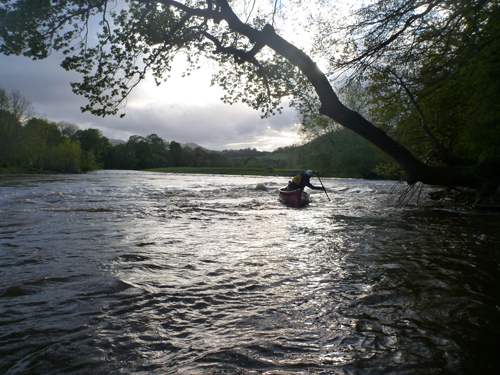 Our week began with an evening canoe trip down The River Dee. Due to some recent rain, the river had a nice flow, and Ali Othen treated us to an evening of fun as we made our way down the scenic river. 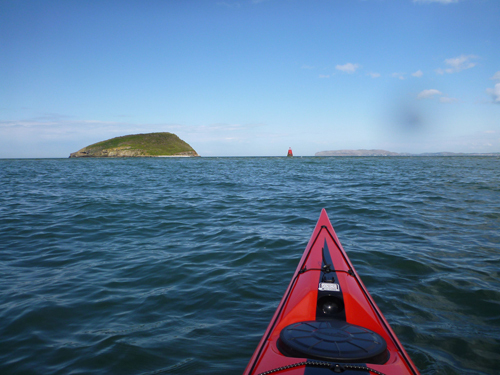 Crossing Penmon Sound to Puffin Island. 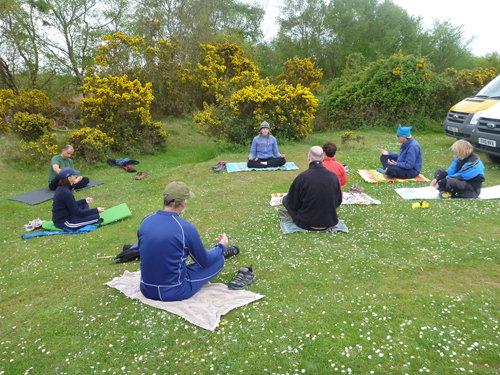 The following day we drove to North Wales where we’d be conducting rolling classes over the weekend. 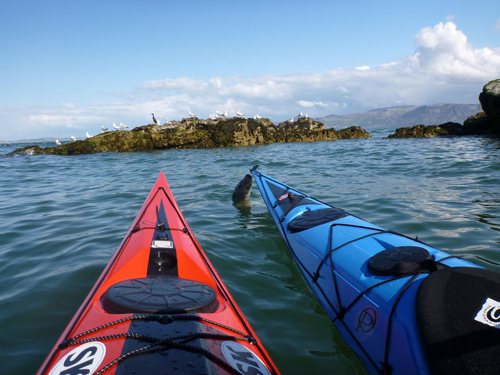 Upon arrival we decided to squeeze in an afternoon paddle around Puffin Island. From the parking lot the water looked flat, and I was expecting a lazy paddle around the island. 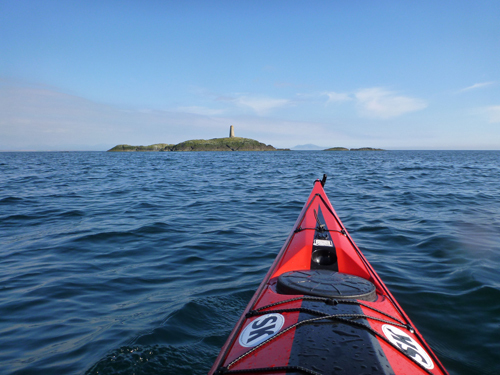 Once in my kayak however, I realized that crossing to the island had to be done with determination, and a little knowledge of moving water. 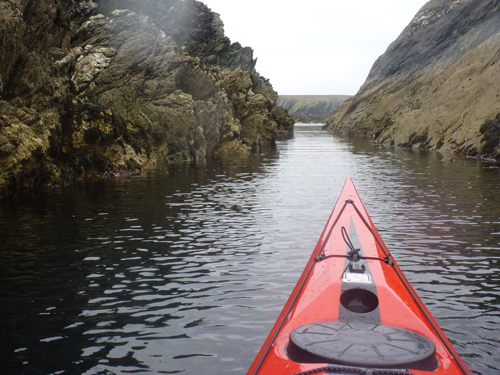 We ferried across, and began the journey around the island, encountering several puffins along the way. At the far end of the island the seals made an appearance, and we were quickly surrounded by them. Their heads peaked out of the water, and it wasn’t long before they were swimming under us and touching our kayaks with their pointed noses. 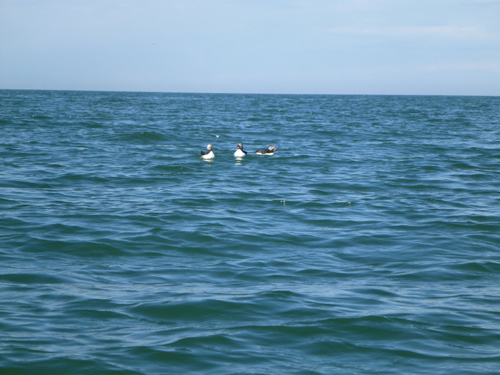 We came across several puffins. At the back end of the island are some overfalls. On this day they weren’t very big, but we bounced around in them for awhile, enjoying the company of the seals, which would poke their heads out of the waves to watch us. 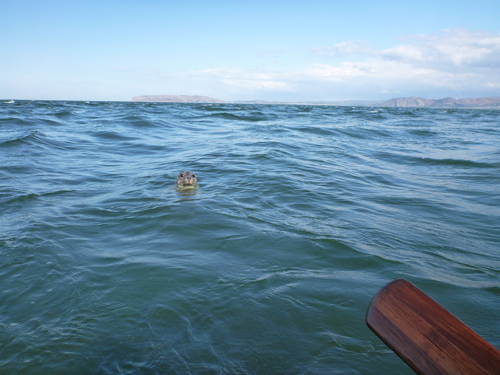 A curious seal checks us out. 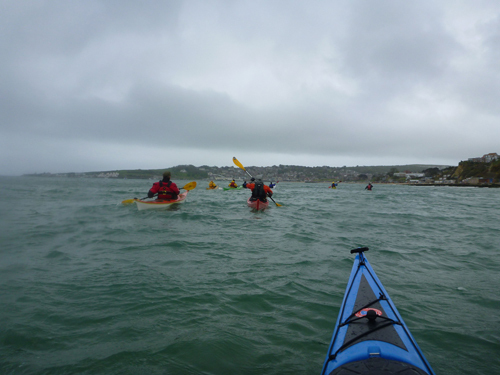 We made our way through the overfalls and to the other side of the island, and enjoyed a leisurely paddle back, with a group of seals following closely behind us. The current had picked up, and the sideways movement of the water from Puffin Island to the mainland was now visibly noticeable. 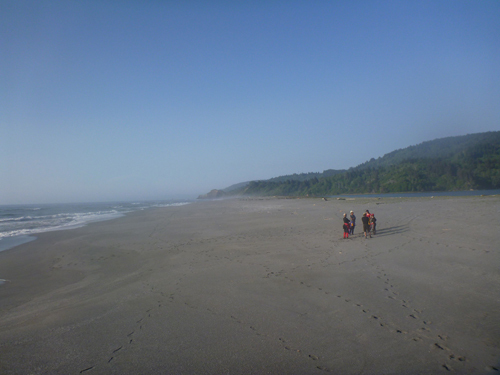 We ferried across, riding the front wave for awhile before landing on the beach. Seals watch us from every angle. 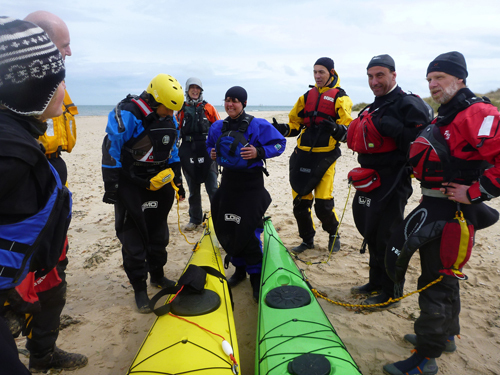 Over the weekend we ran rolling classes on Anglesey, followed by a paddle to the rocky shore just west of Rhoscolyn Beach. Here we played in slots, tunnels and caves. At home I am very familiar with rock gardens, but here they are different. 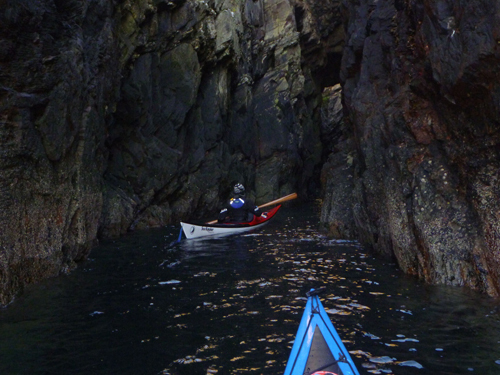 In Wales slots are often used as escape routes from tide races and overfalls. The water in the caves was flat and smooth, and it was easy to explore and enjoy the magnificent, and often colorful rock formations. 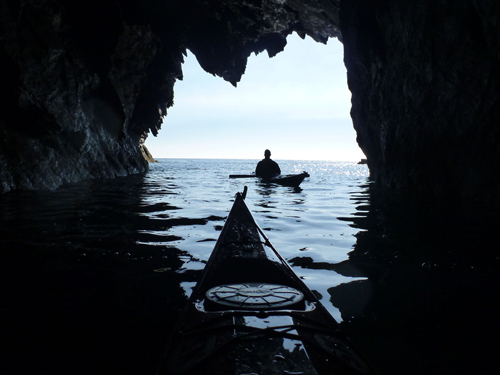 The view from a sea cave. Making our way through one of several slots. 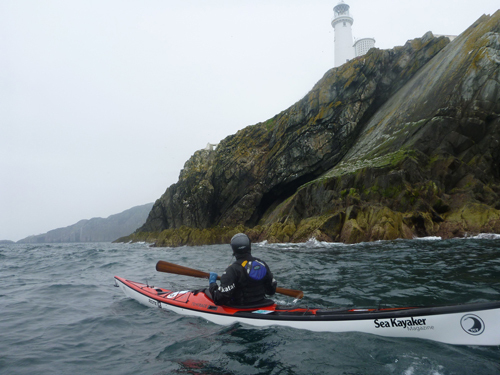 Our final day of paddling took us from Soldier’s Point to North Stack, South Stack, Penrhyn Mawr and back. 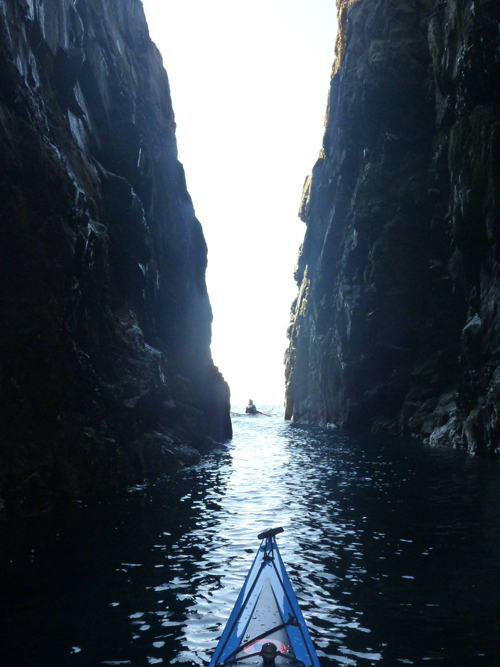 We worked with the tide, hitting the overfalls at North Stack and the tide race and overfalls at Penrhyn Mawr. 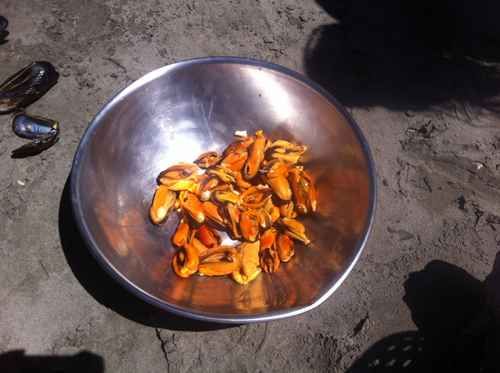 The tides weren’t running fast this day, but it was good fun, and a fabulous day to be on the water. 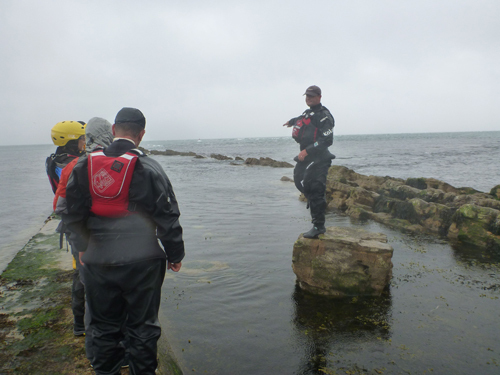 The curious thing about surfing in a tide race or overfalls is that the waves stay in place. 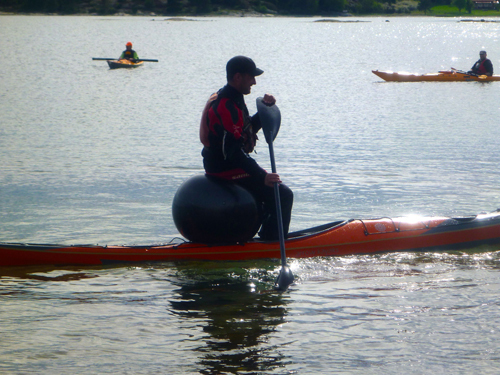 This took some getting used to because I’d see the mound behind me and paddle forward waiting for it to catch up to me. 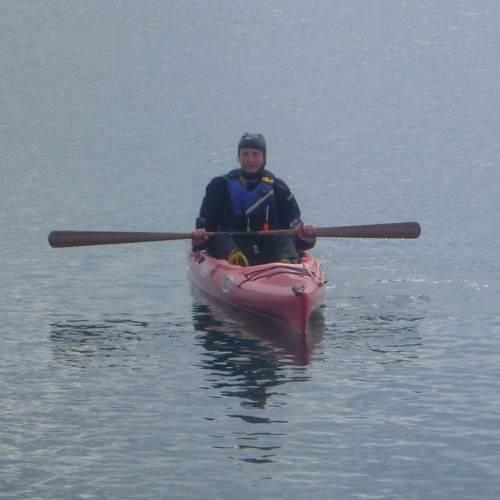 In reality, I was actually paddling away from it. After a few tries I got used to backing into the wave then moving forward with enough speed to catch it. The water was incredibly clear and often colorful. 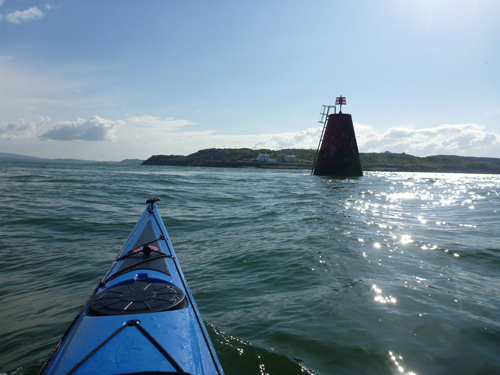 A slot (often called a chicken shoot) which can be used to take a break from the fast moving water in the tide race and overfalls at Penrhyn Mawr. On the way back to Soldier’s Point the wind had picked up a bit, and wind and overfalls at South Stack made for an exciting few minutes going around the headland. From there back to the beach it was smooth sailing. 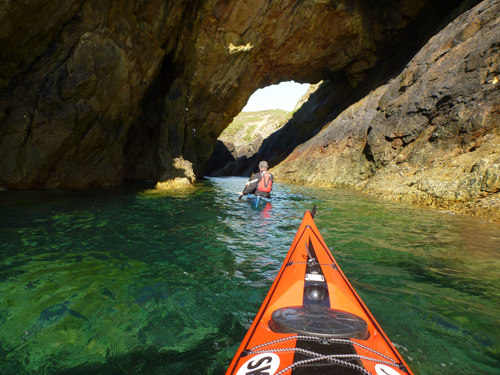 After only paddling these waters a few times, I can see why Wales is a top sea kayaking destination. Heading out to Penrhyn Mawr. Question: When attempting the Shotgun Roll I go over and am able to keep the paddle on my chest and wait for the tip of the paddle to surface. 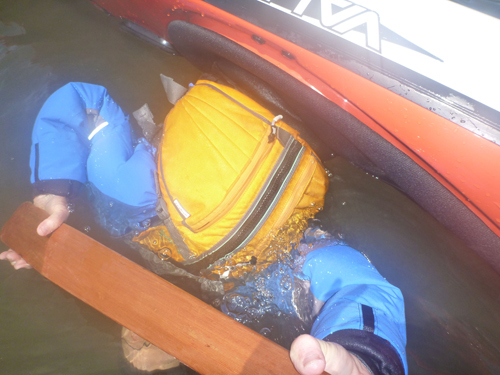 I then turn my hand palm up and sweep, thus rotating the boat on its side whereby I am able to breath. However that is it. Because the paddle is straight out from my hand and not perpendicular (like in a Balance Brace), I am not feeling any support, and I can’t slide up on my back deck. 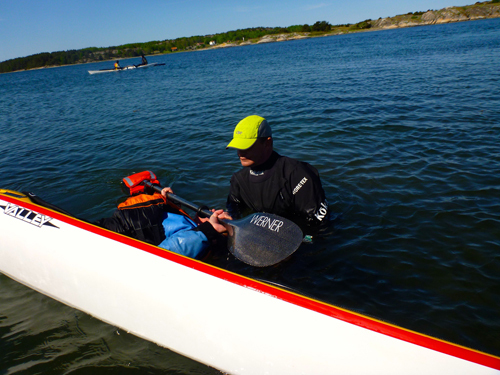 The paddle sweeps as far as the center of my boat, and then if I can’t work my hand to the center so I can do a Balance Brace and slide up, the boat flops over on me and I need to do a layback recovery roll. What am I missing here? Answer: It sounds like you have the concept right. 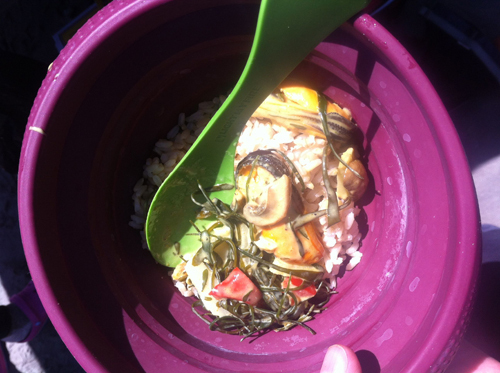 There could be a couple of things that are preventing you from recovering. 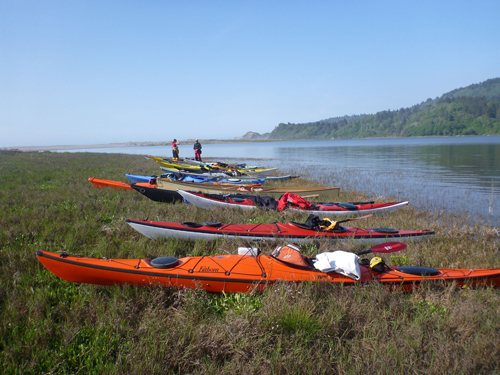 Make sure that you are flat on your back and sweeping the paddle so that it finishes perpendicular to your kayak. 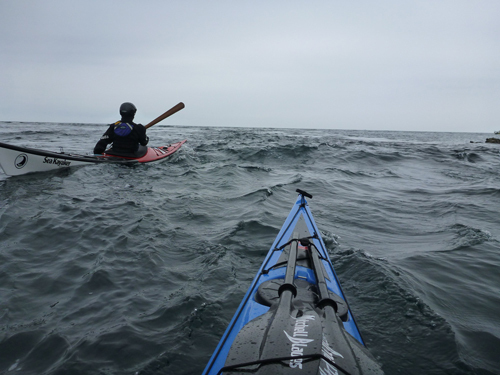 If recovering on the right side of your kayak, try pushing your left shoulder toward the ground during the sweep to square off your shoulders. 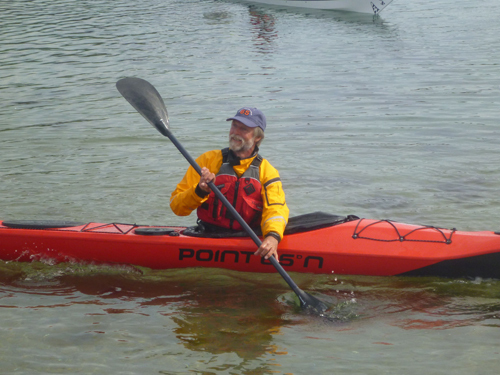 Engage your knee at the start of the sweep, and right the kayak as early as possible. 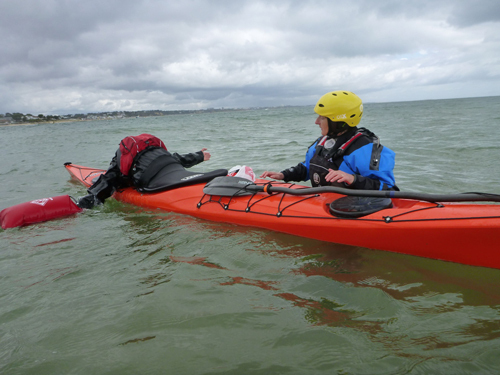 You should feel an arch in your lower back if the kayak is righted enough during the recovery. 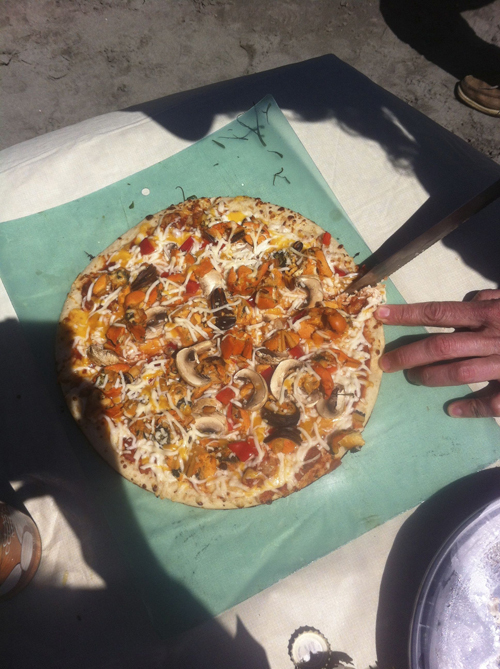 This is a very slow roll, and when done correctly the paddle will provide a lot of lift, more so than the Butterfly Roll.